I describe the design process as like the tip of the iceberg. What you don’t see is the long haul: all the endless auditing and things like that. This week was definitely not about the tip of the iceberg! Moving forward as an artist and in a new studio requires much behind the scene work and I moved forward on several fronts. First, I took some steps this week towards being able to photograph my works in my new studio. Doing my own photography has been a goal for a long time. Now that I am across country from my favorite photographer and have many hand-stitched works that I eventually want to add to my online gallery, I decided it was time to take action. That required much research and then some online ordering to begin to assemble the necessary equipment. One of the most helpful sites that I found on the website was Shoot That Quilt, co-authored by my own web-master, Holly Knott. If you would like to take a peak at what she has written, click here. One of the most entertaining features of this class has been discovering what dyed pieces actually looked like after all processing. I was surprised but very pleased by the mysterious results of my efforts to dye a piece of Kona cotton purple. The fabric on the left is supposed to be a fairly solid purple. The one on the right is my blue-purple. 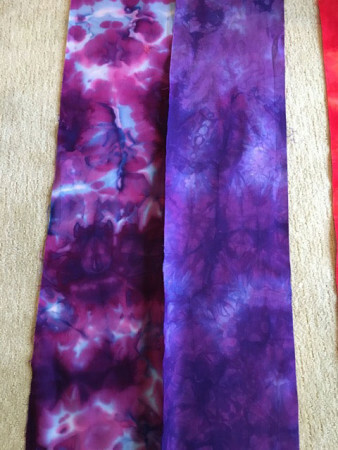 The two component dye solutions that were used for these pieces did not mix well, particularly in the case of the purple. Perhaps it was the temperature of my warm water? I don’t know and may experiment further in the coming weeks. It was clear though that I will be dyeing explorations of the class long after it concludes. And so, I am taking the time to process and record notes as I go along. I also am stretching out the dyeing for a more relaxed schedule that works better with other demands on my time. It all is quite a bit of fun and I am looking forward to the next class where I am told we will discuss over-dyeing. I did move forward some more with my Winter Scene piece. It is now quilted and awaiting a binding. Here is a quick glimpse at how it evolved. And, I continued to work on my latest hand-stitching project. It should be completed by next week. I should also have a report by then on a workshop by Sandy Turner that I am enrolled in. It looked like a fun project and a way to meet some quilters in our new second home area. By the way, the photo of Antarctica above is one of mine from our trip there several years ago. That trip continues to rank as one of the most memorable that I have ever taken. Everything you read about the out-of-this-world feeing of Antarctica is true. Gliding in ice flows, past huge icebergs, and among mammoth glaciers is a great reminder of how small we are in this universe – a great wake-up call to the ego, and totally inspirational for the artist! As always, linking to Off the Wall Friday. Check out what others have been up to! Hard to believe we used the same dye recipe and Kona Cotton PFD. Your results and my results with dyeing the purples don’t look anything alike. Wonder what we did differently. Your dyeing results are very interesting! And beautiful! Your Winter Scene is wonderful! I really like the quilting in the snow. 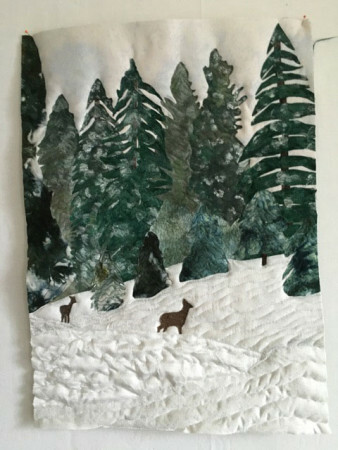 Your Winter Scene quilting looks very good. Holly Knott’s site has excellent advice on how to photograph quilts. That’s how I learned. There aren’t any good textile photographers in my area so I have to do my own. I still hate doing it, but her directions get the job done. Love the iceberg picture, that must have been an amazing trip. Sometimes when you are mixing colors, especially for purple, you get the results you did. The red tends to overpower the blue. I also think that it probably needed to be moved around in the dye more. The chemistry of those non-mixing dyes intrigues me- it almost feels like marbling. I don’t know what could cause it, but I’ll be interested to hear more of your experiments. I love both your purples, but if you were going for a solid they missed. I think mistakes are very inspirational and never a waste of time. i look forward to your dyeing adventures. Winter Scene is beautiful! Terrific work. Great beginnings for your dying work. Can’t wait to see more! You are indeed doing a LOT of behind the scenes work. Photographing your own work is a tall order and I’ll be interested in your thoughts on that. 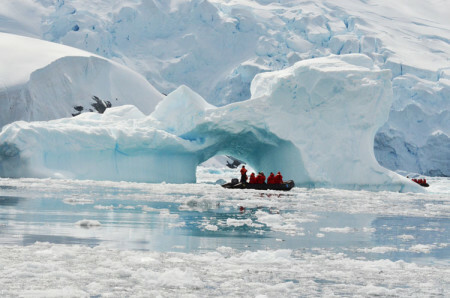 I would love to visit Antarctica someday and your photo just fuels that desire. you have been to Antarctica??? I am beyond jealous!!! 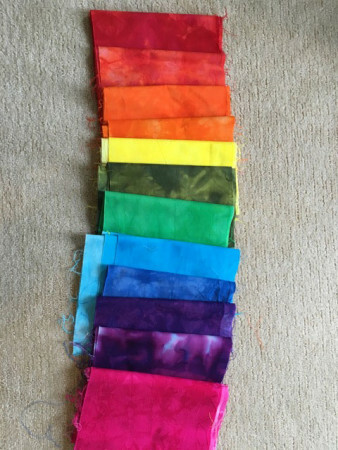 You have really achieved some beautiful colours from your dyeing Judy….